Orange and Green lives on! 3D renderings of one the Mid-Century Empire Builder's unique observation cars currently undergoing restoration. The Great Northern Archive is a collection of information about the Great Northern Railway, primarily during the streamlined era of 1947 to 1970. Highlights of this site include; A complete roster of GN's streamlined passenger car fleet, cross-referenced with photos from the Cordell Newby collection at the joint GN/NP archive, GN accident reports, the 3D GN passenger car modeling project, photos and videos, and more — see more features in the sidebar. Additional materials have become available to share (Thanks to Bob Anderson) from the puzzling 1966 head-on collision of the Western Star and Empire Builder at Buelow, Montana, including the ICC report. The mystery remains as to why veteran engineer Barney Runyan passed stop signal indications and ran into the path of the Empite Builder. Aboard the July, 2015 "Earl Currie Limited" pulled by BN SD9 6234 from Osceola Wisc. to Withrow Minn. one way and by GN SD45 "Huscle Muscle" back to Osceola. The Empire Builder makes a brief appearance at minute 20:00 in this fifties promo film produced by the GN for the Big Mountain ski resort in Whitefish. Plenty of Mid-Century style! This footage was shot from the rear of Amtrak's Portland section of the Empire Builder in July 2010. The video has been reversed and sped up 2X to give a "Cab ride" perspective. There is a veritable treasure trove of 1,300+ GN photos from the John W. Barriger library, now posted on Flickr. Gnarchive.com reader Lou Lederer has generously shared photos taken by his uncle, William Lederer, of the April, 1957 collision in Conrad, MT. The GN Archive staff took a few days off for a trip to Seattle, then east on the Empire Buider to Essex, Mont. for a 3-day stay at the Izaak Walton Inn. Then back on the Builder for the trip to Minneapolis for a flight home to the GN Archive HQ in Philadelphia. Steam, diesel and electric make appearances in this GN safety film, Why Risk Your Life? The film dates from the late forties. New to the archives is a blueprit from August, 1955 illustrating the Empire Builder's consist in detail.Click on the image below to view the whole document. These photos were sent to GN Archive by a reader hoping to find more information about them. The photos come from her grandfather, who worked for the GN as an engineer out of Devil's Lake, N.D. The engine is P-2 Mountain #2524, and the derailment happened in cold weather — there is snow on the ground. There also appears to be the end of a clerestory-roofed passenger car in the background. The 2524 was involved in an accident at Walden, N.D. in 1954, but was on the head end of a 22-car freight and was not derailed, according to the accident report. If you have any information, please email the staff. Over on YouTube, there is this great trove of 8mm color films by Dave Wilkie, and many have clips of GN diesels and electrics, the Empire Builder, a run on GN's only RDC between Butte and Helena and the Internationals. Click here for a selection of the GN-related videos, and link to many more interesting video by Mr. Wilkie of the NP, SP&S and Milwaukee Road around Seattle. Kurt Armbrister produced this video showing passenger trains in and around Seattle from the 50's to the 70's, including views of the Empire Builder and Internationals. Also many shots of NP, UP and Milwaukee action in the Puget Sound.And don't miss the shots of the mini-streamliner in GN colors at the Woodland Park Zoo at about 04:30 in the video! The Marysville, WA and Buelow, MT accident pages have been updated with additional info and photos. An interesting side note to the circumstances of the #27 / #28 head-on in 1952 at Ft. Belknap, MT and the 1966 Empire Builder / Western Star head-on at Buelow, MT is that in both instances, Great Northern president John M. Budd's business car was at the end of the train, and he was uninjured in both accidents. The gnarchive staff had the pleasure of spending 3 nights at the Izaak Walton Inn in Essex in July, 2010, and shot this video of trains in and around Essex. Staying at the Izaak Walton Inn is a must-do trip for GN aficionados, and with the added bonus of BNSF's switch to GN's orange and green colors, it's easy (OK - with the help of a beer or two in fading daylight) to imagine how Essex might have looked in the mid-50's. The staff of gnarchive.com had the opportunity to shoot video out the back of the eastbound Empire Builder between Portland and Essex, Mont. These clips have been reversed, and sped up, to give the effect of a high-speed cab ride (Also to conserve bandwidth and make the video a reasonable length). Columbia River gorge from Roosevelt, Wash. to Portland, Ore.
On YouTube- Glacier Park to Cut Bank area on the Incomparable Great Northern Railway "Empire Builder" in 8mm film by Edgar W. Rynerson. Tom Biery sends this account of riding the Empire Builder in the summer of 1964 at the tender age of 15 — on his own, just for the ride. He took many photos and provided a traveloue of his adventures. This was the summer that the GN suffered major diruptions along its line around Glacier National Park in northern Montana as spring thaws combined with days of rain caused flooding and many washouts between East Glacier and Whitefish. The GN detoured its trains vis Great Falls and on to the NP mainline through Missoula, regaining GN rails at Sandpoint, Idaho. ...maybe somebody will see where it is and come to its rescue! The last place I saw these in service was at Minneapolis Jct. enginehouse in 1980, when I was in BN engine training in St. Paul.... I think four of these ended up on Colorado & Eastern in Goodland, KS, and in 1982, Great Western Railway in Loveland, CO acquired two of them.... At a later date, I looked around Goodland, KS, and in the weeds sat two other partially disassembled NW-5's. Though it was worn out from the heavy transfer service in the Twin Cities and breakdown-prone, 994 disappeared from Loveland, presumably to start its last career, on CBRY. Several years later, the other one that sat behind the roundhouse in Loveland was hauled away to go up to Duluth and was the one restored so lovingly - it looks great! This striking cover illustration from the April, 1947 issue of Science Illustrated has to be one of the best illustations of a diesel locomotive in its time, and happens to showcase a GN E-7. The artwork really shows how the luminous new technology emerged from the soot and black steel of the steam era into the bright post-war future. Sure, the details of the E-7 are very stylized, but the artist really captured the luminous glossy finish of the bright Omaha orange and Pullman green diesel at the moment of its completion, ready to sprint out of the EMD stable into the light. EX-GN NW3#179 is over 70 years old this year and still kickin'! The primary focus of this site is the streamlined passenger trains of the Great Northern Railway, with a focus on their premier train, the post-war Empire Builder in the years 1947 to 1970. This site contains details about streamlined passenger car construction and history in general, with detailed drawings showing the differences between otherwise "standard" design cars produced by Budd, Pullman and American Car & Foundry (ACF). 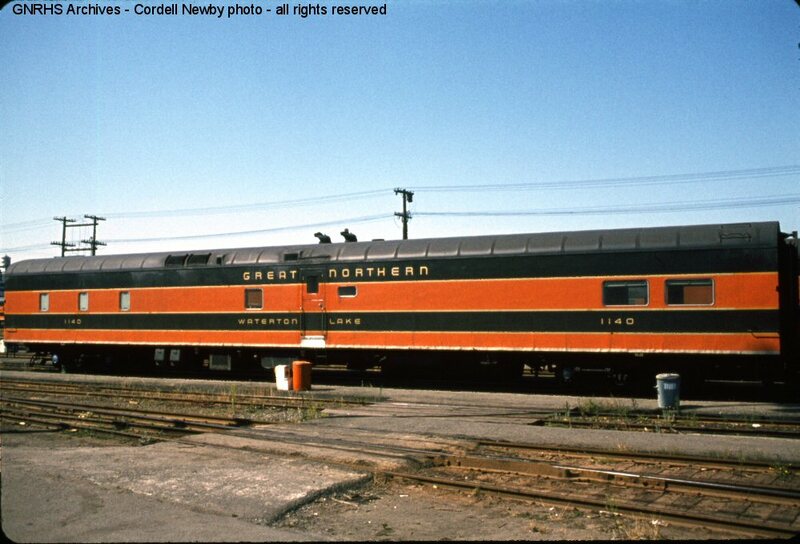 An example is a typical GN coach of the 1100 series, the 1121, a 48-seat day/night coach built in 1947 by Pullman-Standard for the inaugural Empire Builder. The Great Northern Railway Historical Society had already published a detailed reference sheet by Martin Evoy about the 1100 series coaches, so there was ample material to start from. I started using a 3D drawing program at work several years ago and realized the advantages of the detail and view possibilities available by adding another dimension to a drawing. See the St. Nicholas Mt. page>> for more information and images about this project.